OSSINING, N.Y.—On a spring morning at Ossining High School in suburban New York, a group of students gathered in a small classroom at the end of the school’s science hallway. It was a day traditionally known to the senior class as “skip day,” when most of the school’s 12th-graders play hooky and head to the beach to celebrate their impending graduation. 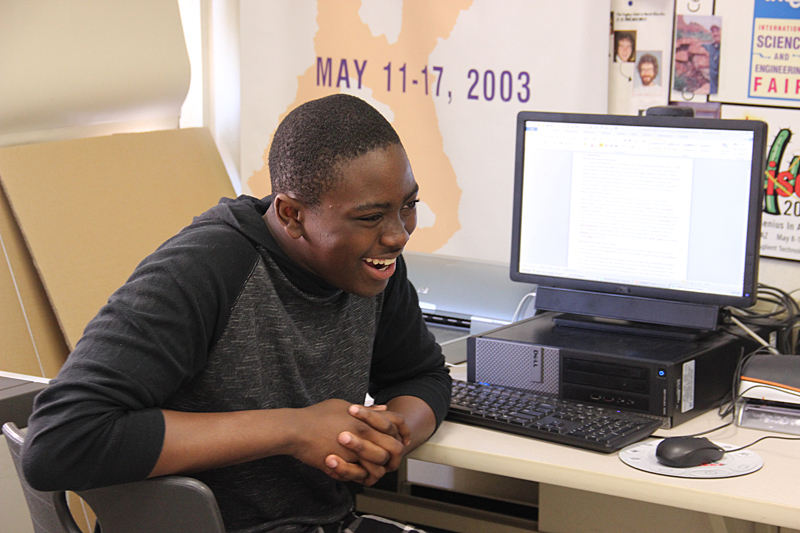 But in the classroom shared by teachers Valerie Holmes and Angelo Piccirillo, a half dozen students had opted out of “skip day,” to spend the day in the science research room, putting finishing touches on projects and chatting with their teachers and classmates. After struggling to attract students when it first launched in 1998, Ossining’s science research program was thriving by 2001. Last year, the Intel Corporation chose the program out of 18 national finalists to receive the top prize in a contest celebrating excellence in science instruction. It is a notable award, but only one of many recent accomplishments at a school with a troubled history. At the same time it was building a nationally-recognized science program from scratch, Ossining High—once the site of race riots—has pioneered new strategies for reducing racial tensions, closing achievement gaps and increasing graduation rates. So far, all seem to be working. The village of Ossining, an hour north of New York City and home to Sing Sing prison, is somewhat of an anomaly within affluent Westchester County. The county’s median income is $80,000, about $10,000 higher than Ossining’s. And while nearly 70 percent of county residents are white, and only 20 percent are Hispanic, half of Ossining’s population is white, and 40 percent Hispanic. For years, Ossining High School, a large stately brick building that stands on a hill overlooking the village, exemplified an achievement gap that is pervasive across America. In the mid-2000’s, fewer than half of black and Hispanic students at Ossining graduated in four years, compared to 85 percent of white students. There were also wide racial disparities in proficiency rates on end-of-year state exams. Since then, the school has made significant progress, nearly doubling the percentage of minority students who graduate, and greatly narrowing the test score gap between student groups. Mandel says the progress is a result of acknowledging the district’s pitfalls. “You have to start by saying ‘there is an issue here,’” he said, adding that it was difficult at first to admit that the district was failing its black and Hispanic students. Ossining’s focus on race dates back to the late 1960’s, when the district created an integration plan for its elementary schools after a state-commissioned report highlighted racial divides between its schools. At the time, about 20 percent of students in the district were black, but in two of the district’s five elementary schools, the student body was less than 7 percent black. In March of 1974, just days after the district announced its voluntary plan to balance the populations in the schools by redrawing boundaries, a race riot broke out at Ossining High School, which, as the only high school in the district, had a mix of white and black students. In the wake of the riot, a curfew was put in place for the residents of Ossining and the school was shut down for several days. The desegregation plan was ultimately successful in evening out student populations. But in 1981, the district went a step further when it eliminated neighborhood schools altogether. Each elementary school took on one or two grade levels, and students began to move, as an integrated class, through the different schools. Mixing students wasn’t enough to eliminate gaps between the performance of whites and minorities, however. So Ossining—hoping to help disadvantaged students start school on better footing—established a pre-kindergarten program available to all students in the district, ran an extended-day program, and created full-day kindergarten. Still, in 2005, the four-year graduation rate for black students at Ossining High School was only 43 percent, lower than the national average. Meanwhile, 92 percent of white students graduated that year. Those numbers pushed the district to zero in on its black male population, half of whom, Mandel says, were failing. The district created a long-term plan to “aggressively, comprehensively, systematically and sensitively” address the education of black males, according to a 2007 article written by former superintendents Phyllis Glassman and Robert Roelle. 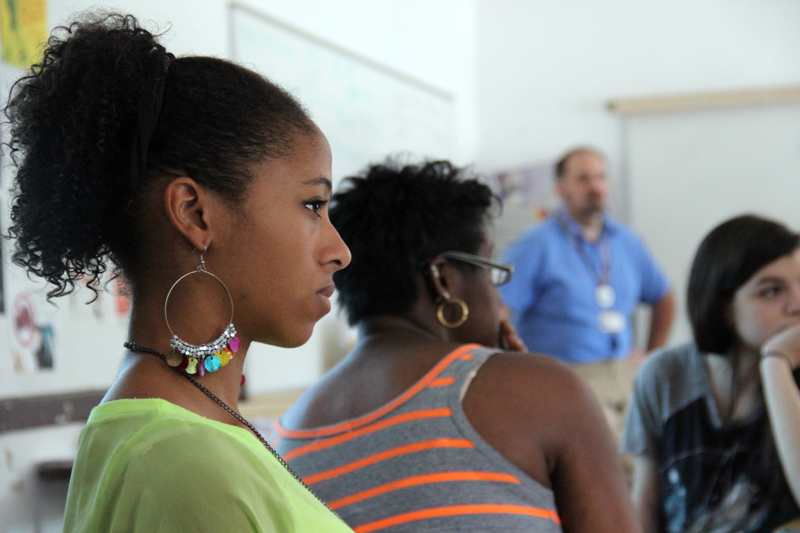 Professional development for teachers began to encompass teaching diverse students and racial issues, and administrators and teachers discussed why black students, and males in particular, felt stigmatized and were performing poorly. In 2005, the high school started a support group for black males called Project Earthquake, which provided workshops and trips to historically black universities. A similar program was developed at the middle-school level to encourage black boys to start thinking about college as early as sixth-grade. The district also increased the diversity of its staff. Between 1992 and 2007, the representation of Hispanic and black teachers rose from 12 percent to 25 percent. Prudence Carter, a sociologist at Stanford University’s Graduate School of Education, says that it’s not unusual for minority students to avoid AP courses because the classes have historically been majority white or Asian and can seem intimidating. “AP becomes synonymous with ‘for those kids, not me.’” Carter said. The elective classes quickly gained popularity, partly, says McRae, because the students could see their lives mirrored in the curriculum. White students also flocked to the classes. Enrollment numbers rose to 45 in some sections. North says that as black and Hispanic students started enrolling in the college-level courses, enrollment for both groups also increased in AP courses. Just two years after the elective courses and Project Earthquake began, the graduation rate for black students grew 16 percentage points. Last year, 75 percent of black students graduated, up from 62 percent just four years ago. Between 2005 and 2013, the percentage of black students who graduated and went on to a two- or four-year college increased from 67 percent to 74 percent. But the demographics of the school were shifting. In the 2003-04 school year, a third of Ossining students were Hispanic. By the 2011-12 school year, Hispanic students represented nearly half of the district’s population. Most of these students, says Ossining High School teacher Marisol Wager, are recent immigrants from South America. “You have students who have interrupted education. You have students who came with a very strong education. You have some that unfortunately did not go to school in their country,” Wager said. As the demographics shifted, the staff of Ossining High School noticed that many Hispanic students had been in the country for a few years, but were still more comfortable speaking in Spanish. They didn’t struggle enough to justify placement in an English as a second language program, but only about 50 percent scored proficient on the state English exam in 2006. That year, high school administrators decided to target these students by creating a bilingual program. Wager, a bilingual science teacher, says that at the time, Hispanic students would fail the same science class three years in a row. “My job is to help them learn science in the comfort of their language, and also help them develop their skills in English,” Wager said. Research on the effectiveness of bilingual education is mixed, but Patricia Gandara, a research professor at the University of California Los Angeles Graduate School of Education, cites a soon to be published study from the University of Oregon, which found that while young children in bilingual programs tend to learn English more slowly, by the high school years, they are academically outperforming their peers who were immersed in English-only classrooms. 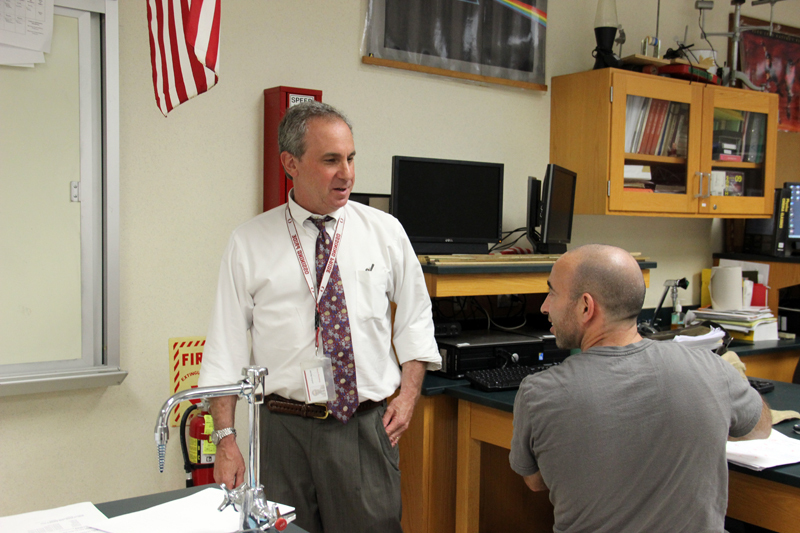 “If a kid doesn’t speak English, it’s really hard to teach him chemistry,” said Gandara. Ossining principal Josh Mandel says that the school’s bilingual program has targeted math and science because those are the classes that can be the most challenging for students who are learning a new language. Ossining’s bilingual program now offers two science classes and one math course for native Spanish speakers, taught by teachers certified in bilingual education. Most students stay in the classes for one year, and after passing the state exam at the end of the year, move on to English-only classes. Hispanic students are performing significantly better. In the 2011-12 school year, 81 percent of Hispanic students scored proficient or advanced on the state English exam, and 75 percent scored proficient or advanced on the math exam, an increase of 27 percentage points in English, and 16 percentage points in math since the courses began. This has shrunk the achievement gap between white and Hispanic students. In the 2004-05 school year, 96 percent of white students were proficient or advanced on the state English test, compared to only 62 percent of Hispanic students. But by the end of the 2011-12 school year, this difference had been cut in half, according to state data. Graduation rates have also risen steadily in the past four years. In 2009, fewer than half of Hispanic students graduated. 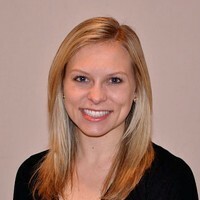 Last year, two thirds earned a diploma. And among the Hispanic students who graduated this year, 86 percent were enrolled in a two- or four-year college, up from 60 percent in 2005. In Ossining—and nationally—the focus on struggling minority students has provoked new tensions. Critics worry the national push to close achievement gaps has prompted schools to ignore thriving students. In Ossining’s case, a non-profit anti-racism advocacy group, the New York Civil Rights Coalition, spoke out against Ossining’s programs in 2007, contending that by targeting black males, the district was engaging in racial profiling, possibly making black boys feel inferior. The Coalition had previously filed a complaint with U.S. Department of Education over similar programs at the City University of New York, but Mandel says no formal complaints were filed about Ossining. Former Ossining school officials have said that even as they created services for black males, the district has initiated programs to benefit all students, including new arts and athletic offerings. The school has also expanded the number of college-level courses and programs that target top students. Its science research program, which principal Josh Mandel says is not as diverse as some of the other classes in the school, has focused more on recruiting students who are interested in and curious about science rather than recruiting a diverse group. “What we’re looking for are students who are passionate,” said Valerie Holmes, one of the two science research program teachers. The program currently has 92 students enrolled for the current school year, of which 60 percent are white, 20 percent are Hispanic, and 10 percent are black. Even though women are traditionally underrepresented in the science professions, the program has succeeded in attracting an equal number of males and females. Holmes attributes this to a large number of female science teachers, who encourage girls to participate. 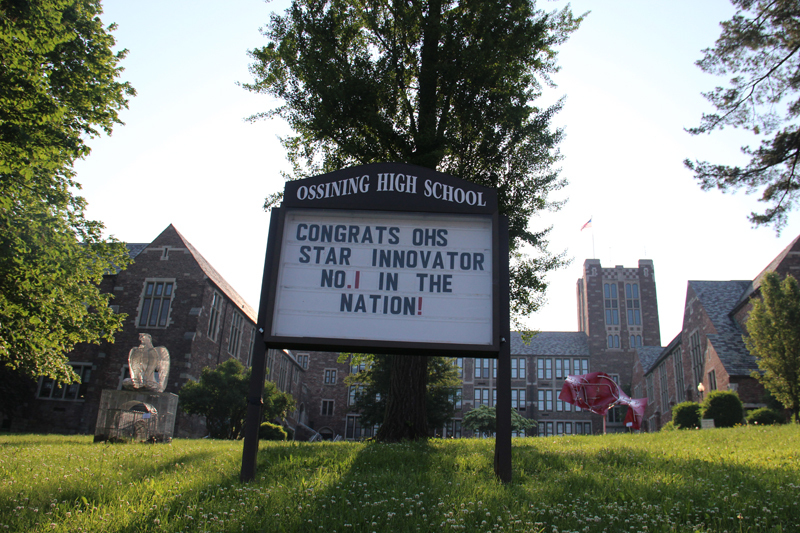 Despite Ossining High’s list of successes, Mandel cautions that its problems defy easy solutions. “We’ve worked really hard for a long time and we’ve had bad years and we’ve had good years,” he said.